This past spring, New England Home Magazine announced the 2018 winners of the prestigious 5 Under 40 award. Andover Landscape Design and Construction's firm partner and in-house architect, Russell Stott, was chosen as one of the five, and would could not be more proud of him and this accomplishment! In addition to this amazing award, the recipients were invited to design a rug to be auctioned off at a charity event presented by Landry & Acari that benefits a very worthy cause. We'll be celebrating Russell, all of his accomplishments, and the other four winners on September 13th when all five rug are auctioned off. All proceeds from the auction will benefit Barakat, Inc., a Cambridge, Massachusetts-based charity that works to strengthen education and literacy in Central and South Asia. In addition to to supporting Barakat, Inc., Russell keeps the philanthropic spirit alive as the Chair of the Greater Lawrence Technical School Horticulture Advisory Board. Russell hopes to share his passion for a well-designed landscape that honors the environment around it with the next generation in this field. 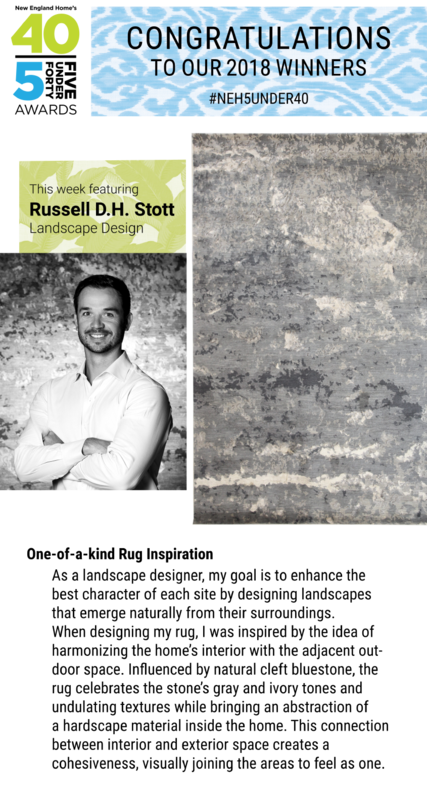 Check out Russell's rug design inspiration below! ANDOVER LANDSCAPE DESIGN AND CONSTRUCTION, LLC.